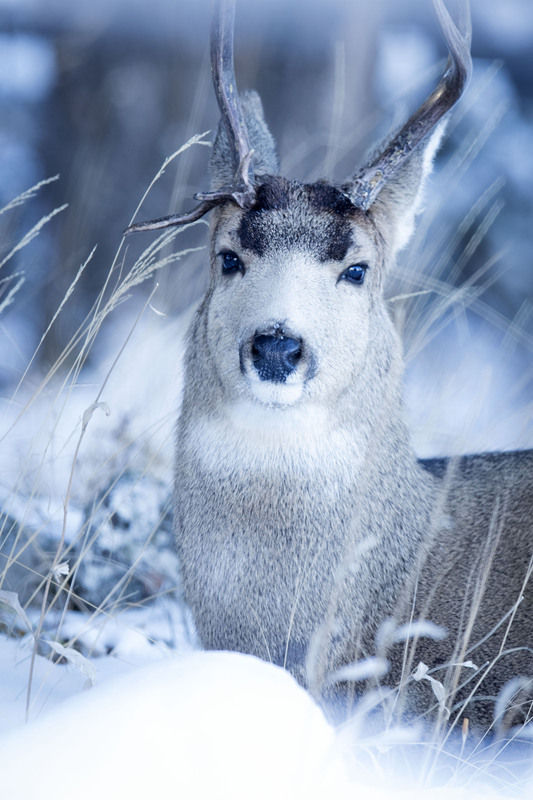 A young White Tailed Buck resting quietly on a snowy morning. From the looks of his antlers he has had a few tussles with other young buck this fall. Now that the rut is over it’s time to relax and make it though the winter. Hi, he was a fine looking guy and we sure hope he made it through hunting season. He looks very healthy, and probably will be happy to shed the wonky antlers! Hi Eliza and those antlers have gone through a bit this year. Looks like he was in a few tussles. Think he should be called Rocky. Beautiful. Rocky is a good name for this guy. We will give it a shout and see if he answers next time we see him in the neighborhood. It was very nice of him to pose for us that morning. Looks as though he’s posing for the portrait. Handsome! He certainly knew we were watching so given his hanging around you could perhaps say he was posing. We would have to agree with that. He does have a bit of model quality to him.